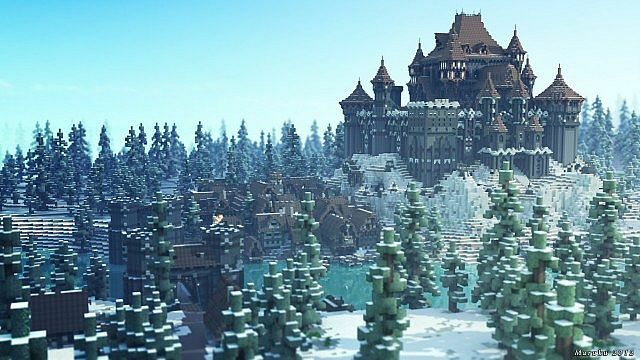 The Dreadfort is the seat of House Bolton, an anicent and powerful house of the North who for many centuries were fierce rivals of the Kings in the North, the Starks of Winterfell. The sinister Boltons had fought the Starks for centuries for dominon of the North, however they were finally defeated and bent the knee around 700 years ago. From the Dreadfort, the Boltons ruled their lands for millenias, and their dungeons are said to be the worst in the lands, and it is said there is a special room where they hang the flayed skins of their enemies... A saying goes amongst the Boltons, "A naked man has few secrets; a flayed man has none"
The Dreadfort is one of the many builds on Westeroscraft. It was built in around 2 days by a team of 50 builders, and its town and interiors took in total about 4 days. 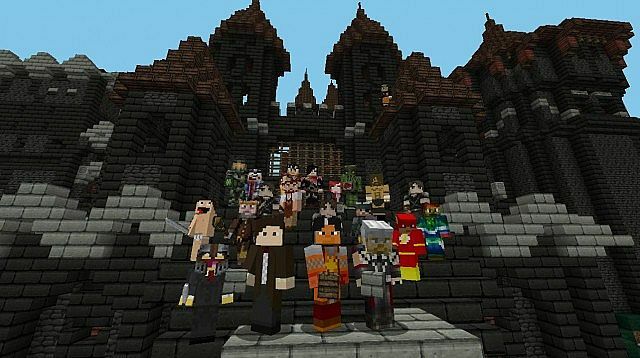 The Dreadfort was a server build, meaning we built it over the weekend with every avilable builder. 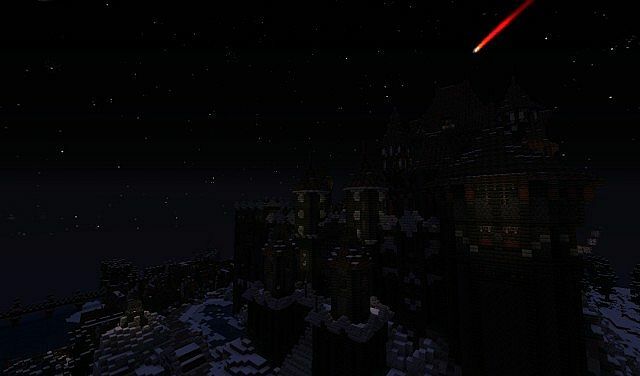 The Dreadfort and Westeroscraft can be found at I.P: mc.westeroscraft.com We used the server's texture pack, a Dokucraft Light remix, as well as SMP Revival customized pack. The renders were done by Maruku and IwanDeLarch. 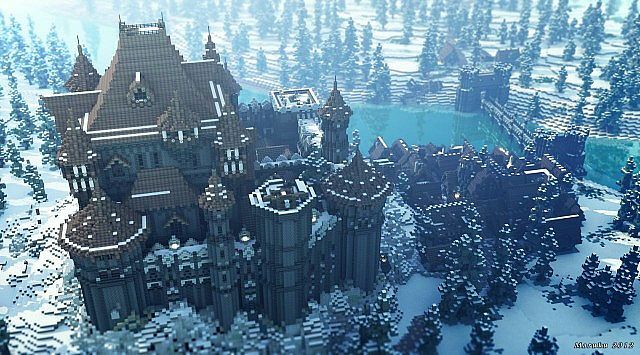 The server's purpose is to recreate the world of Westeros, from George R. R. Martin's epic book series, "A Song of Ice and Fire", upon of which a TV show was made, "Game of Thrones". -King's Landing, the capital of Westeros, with over 3000 unique and fully furnished buildings! I did not build The Dreadfort by myself, I had been one of the 50 builders participating. 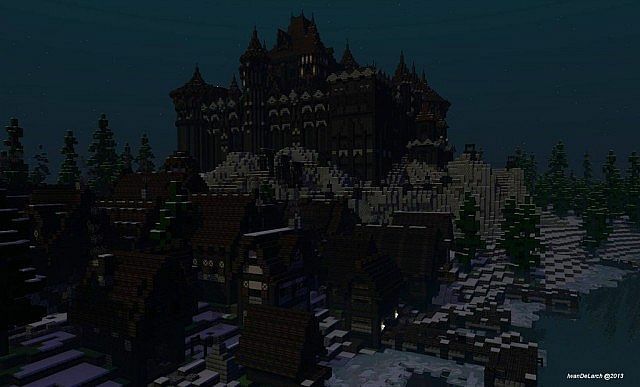 I am the current representitive of Westeroscraft in PMC, and am only here to display the awesomeness that is our server. 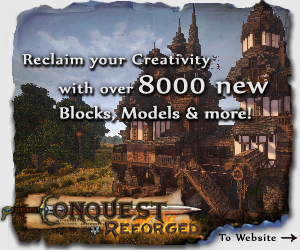 The Dreadfort is now avilable to download! It will be the best if they can make the whole server a single map so that I can play survival on my own with all of my friends so that I can get the freedom to do what I want! Plus I hate it when their's annoying players in the server that talks non-sense! Omg is it the dreadfort? you just see it once in gamo of thronos! How culd you do this :D !!!! is amazing!!! 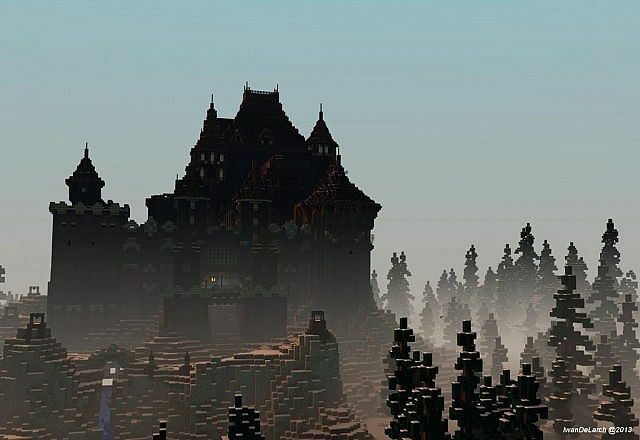 I love to build in minecraft. Can i get some help i mean like Details! We make our stuff based on a mixture of what we see in the show and what information is written about the location in the books. If you want to see the builds or ask the builders for advice come and join us using our launcher which you can download here! 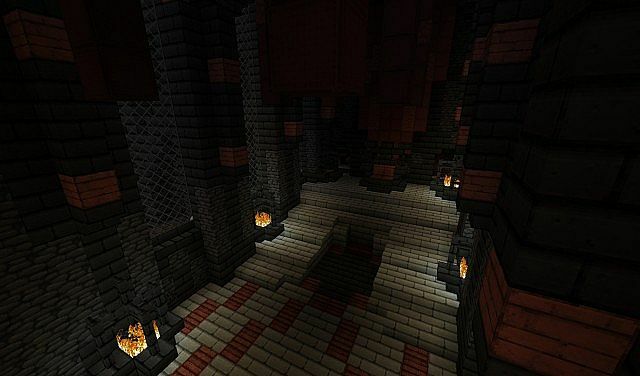 I've been trying to download the texture pack, but the server is closed and I am going to start a minecraft animation series and I want to use this map in my first video, I will credit it of course. But can you send me the texture pack perhaps? The server is online as you can see on our homepage. The schematic file of the Dreadford uses an outdated version of our texture pack, which is no longer supported by our custom launcher. However, you can still get a 1.6.4 compatible version of our resourcepack which doesn't require our custom launcher to work here. Just scroll down to the download section and click on the second link. I've been trying to get a hold of the admin of this server for quite some time. I have some questions regarding the maps their team makes. I am wondering if I can use them in a minecraft machinima movie that I am going to make and put on my youtube channel. I have downloaded the maps and have decided to change a few things, but I will give all credit to them in my video. Please tell me if it's okay for me to do this, and/or help me contact the admin at westeroscraft! Thank you very much!!! It's great that you want to use our stuff in your videos and you are perfectly welcome to, just be sure to credit us! Also, please use our texture pack, because without our specific blend of textures most of our builds look really bad. If you have any more questions, feel free to message this account or head on to our server and ask any of the mods or admins (purple/red names). Alright, thank you very much! I will definitely credit you! All your hard work needs to be recognized :). On the topic of the texture pack though: I'm making my own for the movie by mixing and matching other texture packs, (including yours) Is that ok? I do think your builds look way cooler with a texture pack, rather than the original Minecraft textures, but I want to make my own pack specifically for the movie. But it will look a lot like yours! Just wondering if you guys are okay with that. That should be fine if you only use it for your Youtube series, but make sure you credit both us and the DokuCraft TSC team, as they worked on many of the textures you see in our resource pack. If you plan on redistributing the pack, you have our consent (as long as we are credited) but you also need to get consent from the Doku team. I can't say what the video's problem is... but fixed the download, sorry for the long delay! I got in touch with the admin of the server who also uploaded the video. He will be looking into this. wait, your providing downloads for these now?! HAHA. I had the same thing happen with Kings Landing. I spent an hour watching the whole thing go up in smoke. I felt like Stannis on a good day. Oh, the Dreadfort is awesome!! What rendering program do you use? how is it possible to join your server? have seen both seasons and can't wait until third is coming! awesome work. All my yes, this is just, too good. The build itself took around a week, with the main exteriors done after probably 2 days (it's been a server build, so we had a lot of progress in the first few hours). Finishing touches, the town and surrounding area and the dungeons/interiors took around 3 or 4 further days. What I think of this: Unorginal, made Original. Amazing job, i'm on my way to be like you. This is amazing! I really want this map for my server spawn cause it so awesome! diamond for u! D'awe, let that little guy have his fun, too! Nice Work.. keep it up! i was blinded by these stunning pictures! now i have to use DIAMOND EYES! 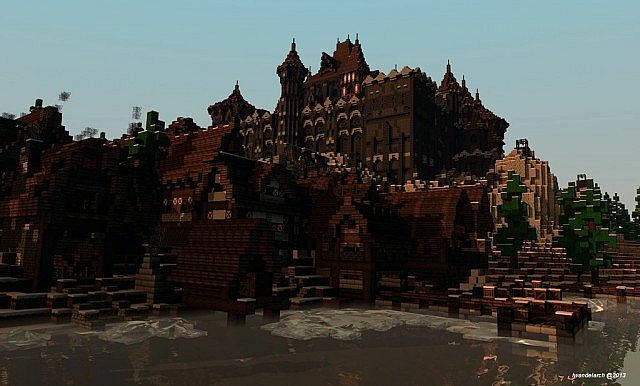 Absolutely beautiful, never seen such amazing structure in Minecraft. The scale is the best, it's realistic as hell, good depth. Congrats! You earn a diamond, a sub and favorite! I NEED TO DOWNLOAD PLEASE PUT A DOWNLOAD LINK!!!!!!!! !